The Moon-Vac has two display levels to accomodate up to several machines. 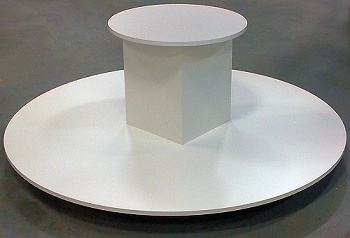 The bottom table top is 64 inches in diameter with a pedestal top of 21 inches in diameter. The pedestal gives the main item predominance above the rest. The base gives a nice rise off the floor with heavy duty casters for easy moving. Table height from floor 6"